Wondering how to cook quinoa to perfection? Quinoa is a delightfully versatile addition to a vegan diet. Quinoa is high in protein and fiber, and you can add it to salads, chilis or you can make a basic, easy side dish with quinoa. Or you can eat it for any meal as a healthy quinoa bowl. The best part is that quinoa is easy to cook, even easier than rice. Below are several methods on how to cook quinoa just right. If you want to know how to cook quinoa as a basic side dish, it’s as easy as boiling pasta. You get a pot of water or veggie broth boiling, and then stir in your quinoa. You want one part of uncooked quinoa to two parts liquid. Then you simply simmer the quinoa on low heat until it’s done. This usually takes roughly fifteen minutes, but check the consistency of the quinoa. Just don’t open the pot too much as that can affect cooking times. You’ll know it’s done when all the water is absorbed or it’s the level of softness you like. You can play with the texture by adding some water to make a more porridge consistency or you can use a little less water for a drier grain that separates. When you’re finished, you can also fluff and separate the grains a bit for some added presentation. A cool little trick to get a more rich, toasted flavor is to brown your raw quinoa in a pan before you boil it. It gives quinoa even more of a nutty flavor. You’ll simply add oil to a pan over medium-low heat and then add your quinoa. Make sure there’s enough oil to coat the bottom of the pan and enough quinoa to evenly toast it in one layer. Toss it until it’s evenly browned. Because quinoa is a grain that’s similar in texture to rice, you can also use a basic rice cooker to cook your quinoa. This is also easy, as it requires one part raw quinoa to two parts liquid (water or broth). Add both the liquid and the quinoa to the cooker. Then you simply turn on your rice cooker and let it cook. Usually it takes about thirty minutes with this method. Fluff it with your fork at the end. There’s considerable debate out there as to whether you should soak your quinoa before using it. 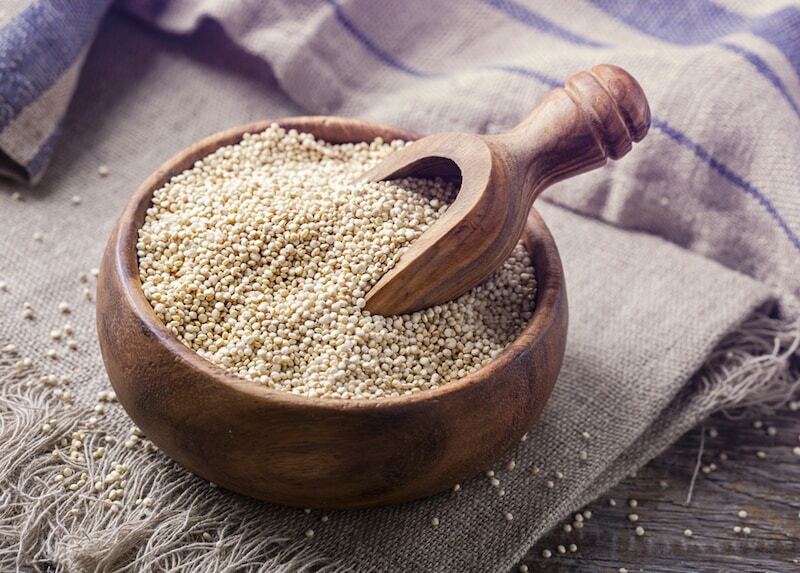 The theory, outlined at thenourishinggormet.com, states that soaking the quinoa before cooking is supposed to make it more easily digestible and get rid of anti-nutrients. What the heck are anti-nutrients? These are synthetic or natural compounds that interfere with the absorption of nutrients from food. An example is phytic acid, which is common in grains and can bond with vital nutrients, making them harder for the body to absorb. Soaking quinoa also makes the grains lighter in texture and easier on the stomach. You do this by soaking quinoa in warm water in a warm place with an acid enzyme like raw apple cider vinegar. You use one part warm water to one part quinoa for soaking, and add a couple splashes of your raw apple cider vinegar. Let soak for 12-24 hours. Then strain and rinse the quinoa well before cooking.